A steady stream of natural gas seeping out of the pipe casing in a well in Southern California may take three to four months to plug. (Bloomberg) — Call it the invisible spill. You can’t see it, but it’s there—a steady stream of natural gas seeping out of the pipe casing in a well in Southern California that may spew as much greenhouse gas into the air as a half-million cars do in a year. Pipeline operator Sempra Energy says it may take three to four months to plug. Using the same tactic that eventually ended the giant 2010 oil spill in the Gulf of Mexico, the company is boring a well that’ll intercept the damaged one to stop the seepage. Meanwhile, it’s moving hundreds of people into temporary housing and faces as much as $900 million in costs including relocation and legal expenses, based on Bloomberg Intelligence and government data estimates. The 8,700-foot-deep (2,650-meter) well has leaked 800,000 metric tons of gases contributing to global warming over the first month, about a quarter of California emissions by state estimates over the same period. The $900 million cost estimate is based on a worst-case scenario that assumes maximum injuries and includes relocation, response, litigation and the loss of natural gas expenses, according to the analysis by Bloomberg Intelligence analyst Brandon Barnes and data from state officials. It doesn’t include potential fines and penalties. “It is much too early to speculate on any financial implications from the situation at the Aliso Canyon facility,” he said by e-mail. “We will not be speculating on ‘what if’ scenarios.” The company has insurance for its storage business, he said. Sempra fell as much as 4.7% on Monday. Shares were down 2.7% to $95.00 at the close in New York. Much as with the crude spill from BP Plc’s Macondo well five years ago, regulators have struggled to get a handle on the magnitude of the leak blowing gas into the Porter Ranch neighborhood. Sempra won’t be able to tell how much gas has escaped until the flow’s been stopped, Mendoza said. 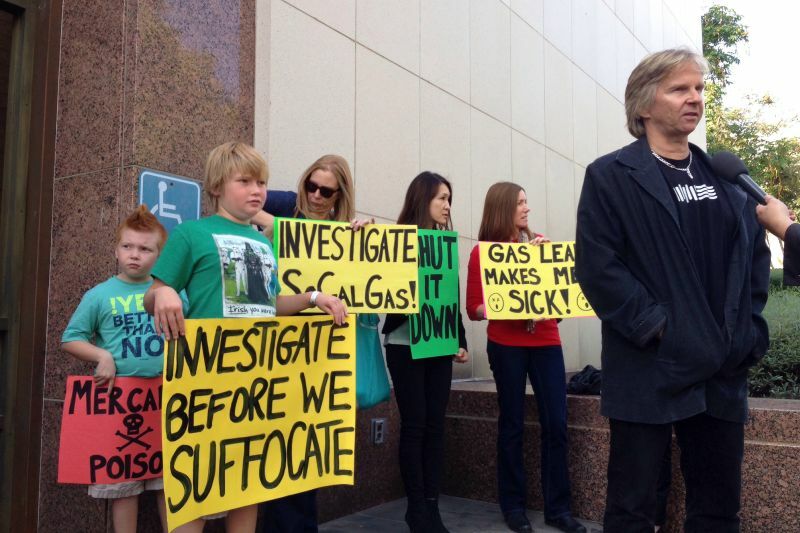 Sempra and its Southern California Gas Co. unit face at least two lawsuits by Porter Ranch residents who claim to have been sickened by the leaked gas. The city of Los Angeles filed suit against Southern California Gas over the incident, according to an e-mail statement Monday from city attorney Mike Feuer. The incident highlights the risks associated with the rapid transformation of America’s natural gas pipeline network. Cheap supplies surging out of shale formations in the past decade are altering pipe flows and increasing the country’s dependence on the heating and power-plant fuel. Workers for Southern California Gas discovered the leak on Oct. 23 at a well in the mountainous Aliso Canyon storage field, about 30 miles (48 kilometers) northwest of Los Angeles. Efforts to stop the flow of gas by pumping fluids straight into the well have failed. The utility started drilling the intercepting well on Dec. 4, the company said in a statement on Monday. The utility continues to withdraw gas from the storage facility to serve customers, the statement said. Southern California Gas CEO Dennis Arriola has apologized and said in a letter to Porter Ranch residents that the gas utility is doing everything it can to fix the leak. The county health department said those exposed to it may experience short-term symptoms including nausea, coughing and headaches. Southern California Gas is trying to determine the best way to cap emissions from the site, the utility said in its statement. As much as 60,000 kilograms of natural gas an hour has been leaking, according to David Clegern, a spokesman for the California Air Resources Board, a state agency that regulates emissions. That translates to about 800,000 metric tons of greenhouse gas that has already seeped out of the well, he said. About $12.2 million worth of gas may be lost should it take Sempra three months to fix the leak, said James Williams, president of energy consultancy WTRG Economics, basing his estimates on the state data and natural gas prices last week. The leak hasn’t affected regional gas or power markets, said Chris DaCosta, a Boston-based analyst for energy data provider Genscape Inc.
A handful of state agencies are coordinating a joint response to the leak, said Don Drysdale, a spokesman for California’s Division of Oil, Gas and Geothermal Resources. There will probably be a third-party investigation once it’s plugged, he said. –With assistance from Edvard Pettersson.